The above info came from Jess Smith, and was edited by yours truly (contact me). The image came from nnm.ru. 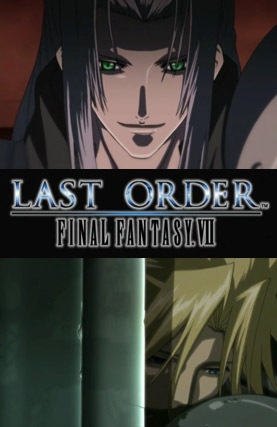 Last Order was released as an anime with Advent Children, I think, to explain some of the points in it. It takes place a few weeks before the storyline of Final Fantasy VII. Tseng and the Turks are in pursuit of two runaways who escaped from the Shinra Mansion at Nibelhiem and are heading to Midgar. Tseng reviews the profiles of two men, Cloud Strife and Zack, recapping the ordeal they went through during the horrific events that occurred five years when Sephiroth burned the village! to the ground and attempted to take Jenova out of stasis. The above description came from Jess Smith and Fractyl, and was edited by yours truly (contact me).